This gorgeous tour of Northern Italy and Switzerland will take you to beautiful towns, with spectacular surroundings. 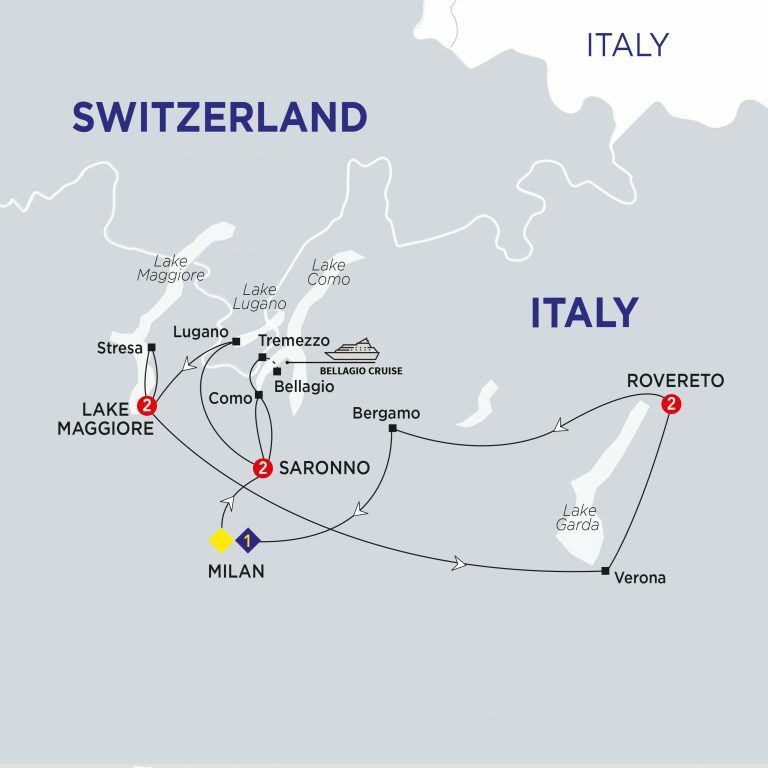 Visit the famous Lake Garda, Maggiore and Como in Italy, and Lake Lugano in Switzerland. Enjoy sightseeing tours of Milan and Verona and take a funicular ride between the two centres of the city of Bergamo. This tour has many optional experiences for you to cater your holiday to your budget and interests. Welcome to the Italian Lakes region. Airport transfers will be provided from Milan Malpensa Airport to your hotel in Saronno. Well known for its almond or apricot kernel biscuits (amaretti), the sweet, almond-flavoured Italian liqueur called Amaretto is also produced in this town. After check-in relax and unwind before meeting your Travel Director and fellow travellers for an included dinner at the hotel. After breakfast enjoy a short drive to Lake Como and an included cruise to Bellagio known as ‘the pearl of Lake Como’. The legendary beauty of this tiny lakeside village has attracted the rich and famous throughout the centuries. Join us for a delightful dinner, drinks and music at a beautifully converted farmhouse in Saronno. This morning make your way to the Swiss city of Lugano which is also known as the ‘Monte Carlo of Switzerland’. An ever-growing number of celebrities, entertainers and successful athletes have residences along the shores of this scenic lake. Enjoy free time to walk along the lake or do a little shopping for Swiss souvenirs. Later travel back to Italy for a two-night stay at your hotel on the western shores of Lake Maggiore. This evening enjoy an included dinner at your hotel. Enjoy a scenic lake cruise to view villas and villages on the shores of Lake Lugano. Then, we’ll board the funicular which will take us slowly to the summit of Lugano’s most well known mountain and to the balcony of the Swiss Alps! Here you’ll have time to explore and admire the beautiful views and breathe the fresh mountain air. Lake Maggiore is the second-largest lake in Italy after Lake Garda and one of the most scenic. Immortalised in the American writer Ernest Hemingway’s novel ‘A Farewell To Arms’, you will have a free day to explore or perhaps take an excursion to the Borromean Islands. We’ve organised a private launch to take you to the beautiful islands of Lake Maggiore. Here you’ll see the Isola Madre, the Isola dei Pescatori, and on the Isola Bella we visit the magnificent palace of the Borromean Princes (this optional is only operated between mid March and the end of October). Come with us to the city of Varese, on the border with Switzerland. Enjoy wonderful views from the UNESCO World Heritage site of Sacro Monte as we take you to Estense Gardens. We’ll end the tour of Varese’s main sights and monuments with free time for shopping and relaxation. This morning travel to Shakespeare’s romantic Verona where you enjoy an orientation tour of the town including sights such as the Roman Arena and Juliet’s Balcony. Afterwards you will have free time to savour the atmosphere of this historic city. This afternoon take a scenic drive along Lake Garda, before arriving at your hotel for a two-night stay. Consider taking a boat trip across Lake Garda or maybe join a full-day Optional Experience into the Dolomite Mountains where you can ride a cable car up one of the mountain peaks for spectacular views. Come with us and follow the Adige Valley to Bolzano, capital of the southern part of the Tyrol. Here you’ll have time to shop in the arcaded streets, take a cable car to the top of the Renon and ride on the century-old Tramvia, or Funivia in the local parlance, where you can enjoy incredible panoramas from this famous mountain plateau. En route to Milan stop and visit the attractive town of Bergamo by funicular. Move from the lower town to the upper town enjoying the breathtaking views. On arrival in Milan, enjoy a walking tour of the city centre with your Local Specialist including views of the Gothic Duomo, the 19th century Galleria and La Scala Opera House. This evening enjoy a final dinner at the hotel with your companions. Join our Local Specialist at the impressive Castello Sforza museum, where you’ll see the ‘Pieta of Rondanini’ by Michelangelo, among other great works. Your tour finishes with a visit to the world renowned ‘La Scala’ opera house and museum. When La Scala or the Castello is unavailable, you’ll visit the Museum of Milan. This morning, say ‘arrivederci’ to Italy, your Travel Director and newfound friends at the end of an unforgettable holiday. Transfers are available to Milan Malpensa Airport. Conditions apply.